I rent-a-room from my ex-gf J. We dated a few years ago for about four years, and have remained friends. Hell, she offered me a room in which to land when I lost my home! The point being, we have been acquainted for going on eleven years(!) And I with her menagerie – a smattering of chihuahuas and cats. Some of whom have passed on (Mike was a terrific boy kitty!). Others remain, and continue to age. The drill used to be to make certain the gate from the back yard into the parking lot was secure, because DYLAN could escape. And has. When I first met Dylan (which I privately spell Dillon – gun folk will get it), she was three, and very animated and active. And she did get loose a couple of times, running willy-nilly, constantly checking for pursuers over her shoulder and laughing. 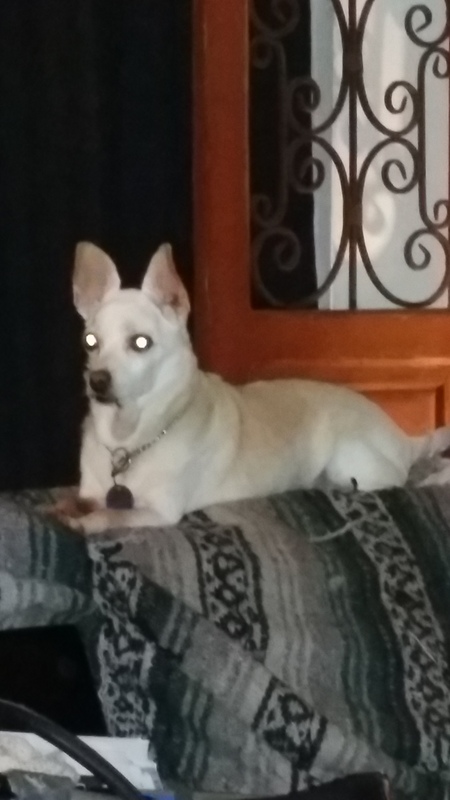 She was a rescue dog, and had probably lived on the street for some time. Of course, the main fear was she’d run into the street and get killed. Now, she’s going on 15-years-old, and has an arthritic back leg. Spends most of her time sleeping, sometimes with one eye pealed for the cats or the puppy. She moves kinda slow. We were alerted by the (evil) HOA to keep our back gate unlocked (an impossibility, due to the spring-loaded lock) lest they need access to make ‘authorized’ repairs and improvements. For a specific three day period. And we were used to the gate being closed and secure. So we had to leave it ajar for the three days. Part of the morning routine was to check the backyard for maintenance folk, close the gate, THEN let the critters out. But the habit, based on years of programming, was just let them out. I let them out, then looked up to see the gate still ajar about a foot. I wasn’t worried. Then, Dylan looked at me and bolted out the gate like a shot! I quickly ran (well, relatively quickly) and called to her. There she was, as if she were again three, running away, looking over her shoulder at me. I let D.J. back inside, secured Lola in her kennel and yelled to J that Dylan was loose. She ran out back with her car keys. I searched the opposite direction on foot. J. is asthmatic. Going to her car is her best bet. I’m crippled. Hobbling slowly after a very fast puppy old lady dog is the best I could do. Dylan did her best to stay about 60 feet ahead of me, even taking time for a ‘rest stop’ – just to mock my pursuit! J. drove around the parking lot slowly, searching. After about 15 minutes, I chased her to Judy, who scooped her up into her car and went home! She ended up running a few hundred yards. Which I ended up walking. Slowly and painfully. The important things are Dylan is back home safe, Judy is breathing okay, and I have additional pain medication. Here is Dylan, after her little ‘adventure’. How closely have you read the 4473? All of us have filled out the 4473 form so many times that we could pretty much recite it and fill it out blind folded. But have you actually bothered to read the stuff after you sign and date 16 and 17? 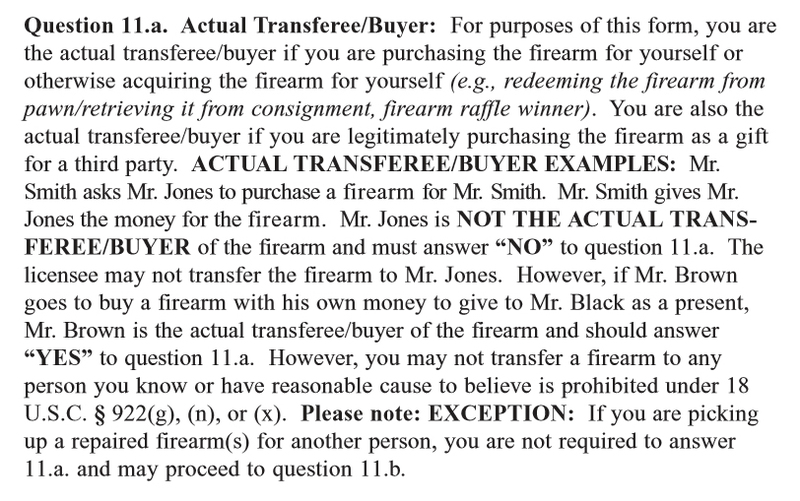 A co-worker was perusing the later section, that hardly anyone reads, and found two interesting things in the 4473 that dispel misconceptions regarding firearm sales. First there is the misconception regarding gifting a firearm. For a long time I have heard, and mistakenly believed, that gifting a firearm is only allowed between parent and offspring or between spouses. This is completely false. Apparently you can gift a gun to anyone you want. Take a look at the screen cap of the section explaining 11a “transferee/buyer”. Did you catch the subtle nuance between the two examples? You cannot buy a gun on BEHALF of someone. But you can buy a gun and gift it to someone. Now the recipient of the gifted firearm must not be a prohibited person. So use common sense, otherwise you will have committed a straw purchase. The other amazing discovery is with regards to residency. Having lived in NY for a couple years as a firearms enthusiast, I look for ways to acquire guns legally using loopholes. Such as buying non NY legal guns in PA but having them shipped to my FFL in NY. Like my Glock 21 Gen4 came with three 13rd magazines. The store clerk said he can’t ship them to NY. I told him yes he can because my FFL will buy them off me or trade them for 10 rd mags. However this recently discovered rule in the 4473 opens up opportunities for a lot of people. In the 4473, under Current Address and State of Residency, there is a section that clarifies it. 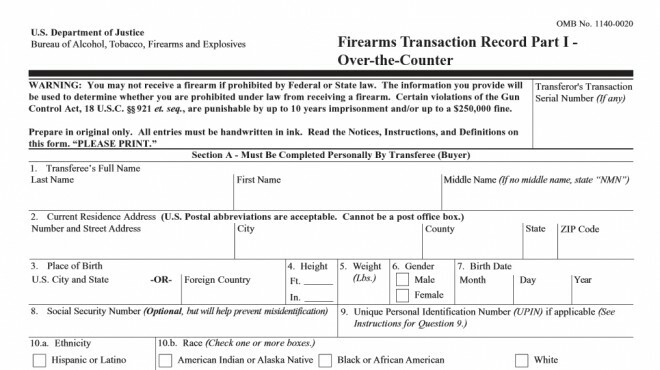 It states that if you have a house in a different state and while you are vacationing there, you must use that address while you are there buying guns. What does this mean for you and me? Well, you can buy handguns in different states and take them with you rather than ship them to another FFL in the other state. Granted you need to have a home or apt with a supporting govt document that shows your address of that other state. So my friend who is still living in NY, has a house in PA .He could go to a PA FFL and buy any gun he wants because he is using his PA address as his current residence. He can get any handgun or AR15 that would be banned in NY and leave them in his home in PA. According to the excerpt above, that would be completely legal. The BATFE enforcement seems to be all about nuance (except concerning Fast & Furious, of course!). Brigid Isn’t The Only Foodie! Neither J nor I cook very much. It’s not that we are lazy. J. is asthmatic and has back issues (being a stylist for 35 years undoubtedly has something to do with it! All that standing and chemicals.) I have my own disabilities. Standing is not something I do well, certainly, it is never pain free. But, sometimes we are able to cobble something together. I had just returned from buying groceries. After putting them away, I decided to fry up all the thick-sliced, hickory-smoked bacon. Why? BACON! Judy came downstairs and asked I vacate the kitchen so she could work. She had me buy a large round loaf of Hawaiian bread at the store. We had eggs. Bacon. Butter. Half-and-half. 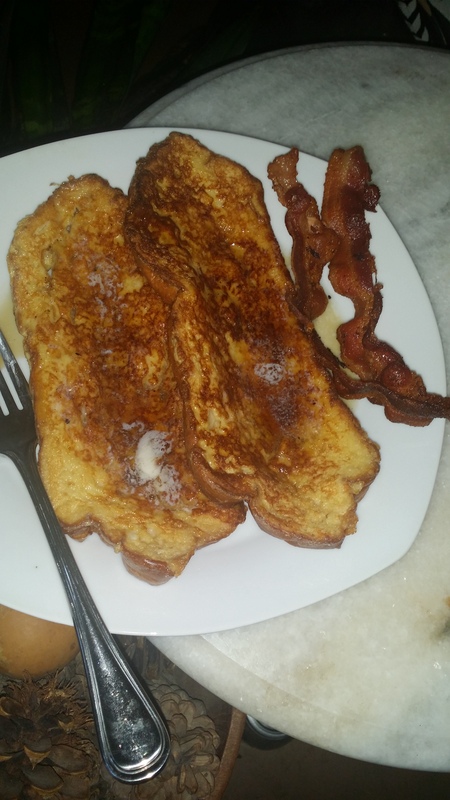 It was time for FRENCH TOAST!! From Karl Denninger at Market-Ticker, we get this tale of what Net Neutrality is really going to mean to us. While the problem is less-severe for “landline” (e.g. Cable, FIOS, etc) customers it is by no means not present. If you have a 50Mbps connection from Comcast, for example, you could consume 375 Megabytes per minute. That works out to 22.5Gb/hour roughly 16.2 Terabytes per month. Again, Comcast cannot engineer for that while charging you $50/month. Can you buy such service? Sure! I used to buy service of similar quality as an ISP all the time — a 44.7Mbps (each direction) DS-3 “clear channel” line for which I actually paid to move that full amount of data all the time. But while it’s gotten much cheaper than the five-digit price tag per month I paid at that time for such capacity it sure as hell isn’t $50/month even today. There was a lot of sentiment from young tech heads that they were being screwed because their ISP was wanting to charge extra for Netflix or other streaming services. Net Neutrality, at its root, says “all bits are equal” and they can’t charge you more for one service’s bits. But they can charge you what it costs them to provide those bits and they can meter how many bits you use. Simply, they’re going to have to charge what it costs them or go out of business, and if they don’t charge enough, they can’t get enough money to build out infrastructure for the Next Big Thing (Netflix 4K?). By the looks of it, we’ll all be having metered internet services in the next few years. Go read the rest of the piece at Market Ticker. Let it sink in. Madeline Singas, Acting District Attorney for Nassau County, New York, is a hypocrite. staff and their families for her own perceived political benefit. own safety on the line to administer justice in her jurisdiction. On Monday, Prof. Eugene Volokh broke the story that the Nassau County District Attorney’s Office bars prosecutors from having handguns, even at home. I remember, in my previous life, working as a private investigator/process server. were not very secure!The judge further conveyed even process servers under his jurisdiction shall be unarmed! In the field!I’m sorry, your honor, but many process servers were attacked and even shot! Fortunately, as this is Arizona, he didn’t extend his ‘authority’ to our homes. to be armed anywhere in the State! SO, many of us were. Back-in-the-day, in a previous lifetime, I was married. And, ‘the wife’ and I, like most young married folk, were poor. And we spent much of our free time off together window shopping. We would adjourn to one of the nicer malls and walk around, people watching, and looking agog at the clean, shiny goods in the various stores. Most ALL of which we couldn’t afford. It was cheap entertainment. Now, here it is 35-ish years later. I’m divorced (although my ex-wife lives about 1/4 mile N.E. of me, and we remain friends). And walking long distances on tiled concrete is not something my legs and feet tolerate very well. SO, as with many other things, I ‘live’ on the Internet! Now, the nice thing about this (aside from wearing boxer shorts whist ‘window shopping’) are the myriad of shopping locations – Amazon, EBay, L.L.Bean, Brownells, Duluth Trading, Dillon Reloading. But wait, there’s MORE! (as they intone on late night TV). Now I don’t know which came first – and I really don’t care (nor do I receive anything from them, FTC! ), but these carbon copies of each other are wonderful merchants who market to MEN (and like-minded women) all manner of things through their respective retailers. Just what every guy with spare funds needs to fritter about a weekend afternoon, purchasing everything from ecofriendly toothbrushes and razors, to rye whiskey and SUVs! 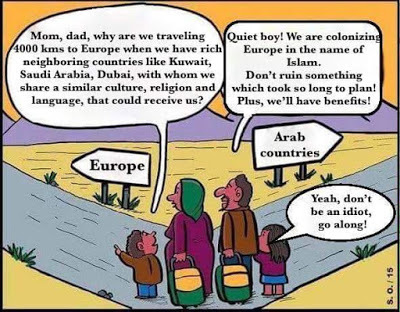 We’re Not Accepting Enough Refugees! The United States is the most generous nation in the world, and we have taken many refugees from foreign lands. Europe has not offered to take refugees from Central America, so why are some politicians here insisting that we take many thousands of refugees from the Middle East? While refugee crises are tragic, crimes committed by transplanted peoples against unwarned, unprotected victims in our own country are even more tragic. Politicians demanding that American neighborhoods accept thousands of refugees, without proper screening or any indication by the migrants that they genuinely want to assimilate into our culture, should be rejected. Americans are horrified by images of tens of thousands of people, mostly unattached Muslim young men from the Middle East and Africa, crossing unguarded borders into Europe. The news media often describe these people sympathetically as refugees from the civil war in Syria, but many could be migrants seeking a more comfortable life in a rich society with a cradle-to-grave welfare state. The scene is eerily reminiscent of the tens of thousands of people from Central America who crossed into the United States last summer. Often described sympathetically as unaccompanied minors fleeing gang violence, most of those Central American arrivals were able-bodied, tough young men who left their families in search of better economic opportunities. Wealthy European nations did not offer to help out by accepting thousands of migrants from Central America. We did not expect that of them, and they should not expect it of us now. The Muslim migrants follow a route through Turkey, Macedonia, and Serbia into Hungary, the European country closest to the Middle East, and from Hungary they can travel throughout 26 European nations. That route may soon close when Hungary completes the razor-wire fence it is building along its entire 108-mile border with Serbia. The free movement of people across national boundaries, without passports, is required by the Schengen agreement, one of the central principles of the European Union. It makes those 26 member countries subject to the weakest link, the country with porous borders, in this case Hungary. Stark financial problems also stand against welcoming so many strangers into our country. More than 90% of recent refugees from the Middle East are on welfare, according to official statistics published by the U.S. Office of Refugee Resettlement (ORR). Our welfare system is already strained by the Central American migrants who entered our country illegally and never went home. There are a potential 6 billion people in the world who would like to partake in the American welfare system if given the opportunity, but we cannot afford to foot the bill for everyone in the world who does not have a job. We should learn from the experience of accepting about 55,000 Somali refugees between 1983 and 2004, which included the Clinton Administration and three different Republican Administrations, and taking another 27,000 Somalis between 2008 and 2013 under the Obama Administration. Many were settled in Minnesota, where Somali participation in a food assistance program increased to 17,300 adults and children, not even including Somalis subsequently born here. We must ask ourselves how generous are we? Or rather can we afford to be? And is this huge migration teaming masses yearning to breathe free? Or is it a tactic to populate and destabilize with mostly young men? AND, is our fear warranted, or simply another crisis to be taken advantage of by those ‘in charge’? Doc in Yuma (a regular, loyal reader and sometime contributor) sent me this regarding control of Food Stamps. Sent to him under the title “Compassionate Conservatism”. steak and frozen pizza, then get a job. tats and piercings, then get a job. doing absolutely nothing was demeaning and lowered self esteem. rewards them for continuing to make bad choices. welfare check. If you want to vote, then get a job. “Food” choices. If an EBT (food stamp) recipient wants T-bone steak or Twinkies to eat – I don’t care! Only so many funds are allocated each month, and buying steak will ‘eat up’ the funds rather quickly. It would be nice if the purchase of TP, laundry soap and similar household items were included on the ‘approved’ list, though. Forced birth control is repugnant to me. And recreational drugs and body disfigurement are not on the food stamp list. Not my problem. I do like the idea of (voluntary) government service to help maintain the infrastructure. I’m not certain it should be tied to receipt of food stamps, however. WOW – what a concept! Of course, while a compassionate State maintains some kind of a ‘safety net’ for the truly needy, I’m a little unclear how this can be administered efficiently, fairly and at a reasonable cost. After all, it IS government of which we speak! Many lives are affected as a result of knife crime in the UK each year. In an attempt to raise awareness of the devastating impact of knife crime and to reduce the number of families affected, we’re campaigning for as many knives to be surrendered as possible. Knife bins will be located in cities around the UK and the British Ironwork Centre will be touring the country, speaking to young people and collecting knives from the streets. All knives will be surrendered anonymously – no names will be taken, and there will be no CCTV cameras recording (Yeah, right – Guffaw). Whatdya think they want to do the same thing here? With guns? And how many criminals voluntarily give up their knives and guns? As a grimly relevant adjunct to my previous post about crime, cops and communities, the voices calling for racially-based violence (especially against police) got louder last weekend (a couple weeks ago). Members of the #FYF911 or #F**YoFlag and #BlackLivesMatter movements called for the lynching and hanging of white people and cops. They encouraged others on a radio show Tuesday night to “turn the tide” and kill white people and cops to send a message about the killing of black people in America. During the show, callers clearly call for “lynching” and “killing” of white people. The President is being largely silent in these matters. Until a Black kid gets shot by a cop – then he sends the A.G. in to support the protesters. I wonder if he sees himself as a latter-day Robert Mugabe, tearing down the culture to replace it with a do-nothing, welfare-receiving, inflationary economy. In other words, changing The United States to a Zimbabwe State?